Another section of the Cycle Superhighway in London was opened. This was the last part of CS6, which starts at Elephant and Castle. 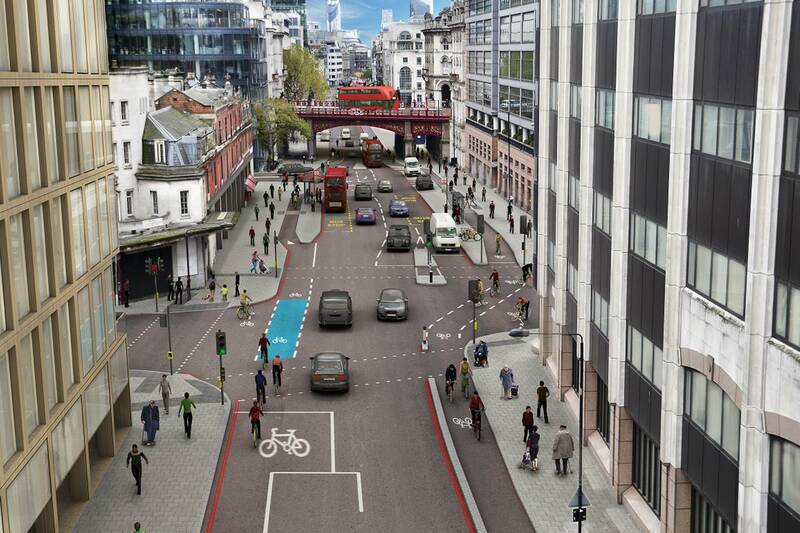 I used to ride this superhighway when I worked at Clerkenwell Green. It was a great path to ride - I would join it at Elephant and Castle on this lane, completely segregated from motorised traffic, ride up through Southwark, over Blackfriars Bridge and then zoom up through Ludgate Circus, only to be dumped onto the main carriageway again at Farringdon and then have fun and games squeezing between vehicles on the part up to Clerkenwell Bridge. So it was good news to hear that a new section of segregated cycle path was opened today by the Mayor of London, Sadiq Khan. We can now ride from Farringdon right up to Kings Cross on our own cycle lane, and with a short section of quiet roads around the back of Mount Pleasant post office sorting office. I haven't yet ridden that route. I don't work there anymore, so I guess it would be for the next time I catch a train up north, from King's Cross, or if I want to go out for a drink in trendy Upper Street. I might even use a trip to the Thursday night crochet group at Loop in Islington as an excuse to go up that way. Anyway, whatever my reason is for going up to North London it is great to know that we have a new cycle lane that will improve safety on the roads, thanks to cooperation of Islington and Camden Councils. I hope that other councils are as amenable to cyclists as these two councils have been. Sadly, Westminster, for instance has been quite obstructive when it comes to improving infrastructure for cyclists and pedestrians. A plan to develop a Cycle Superhighway from Portland Place (near Oxford Circus) north to Swiss Cottage (CS11) was blocked by Westminster. This comes after plans to pedestrianise Oxford Street were shelved. It's quite a shame, given that air pollution has become a real concern in London, with a few places, including Oxford Street and Marylebone Road significantly exceeding EU limits for the number of particulates in the air. Okay, rant over. Laura Laker talks about this in detail on the Guardian Blog. More information about the CS6 can be found on the Transport for London website. I still feel positive about the improvements that have been made to cycling infrastructure in London over the last 15 years, and look forward to cycling along the latest addition to the Cycle Superhighway network.